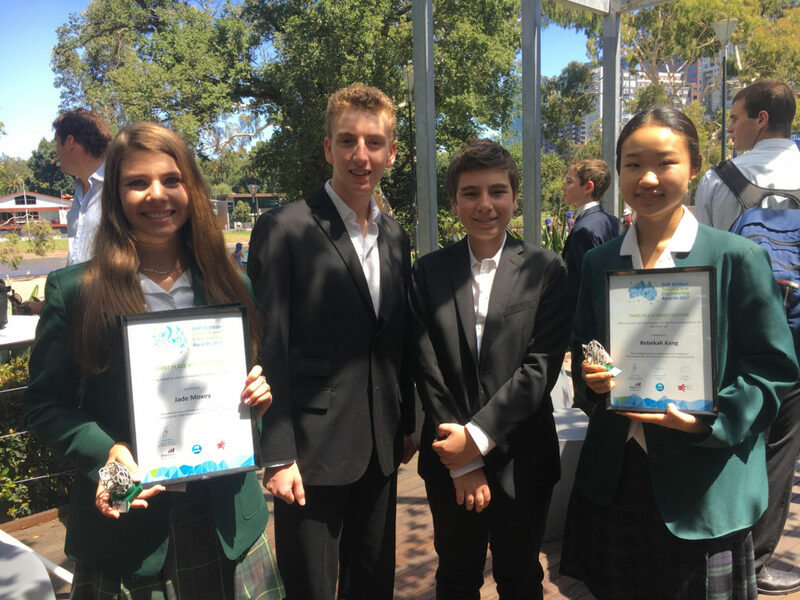 NSW Young Scientist students took out 3 of the 6 major awards at the national 2017 BHP Billiton Science and Engineering Awards. Jade Moxey (left) from Sapphire Coast Anglican School won 1st place in the Investigation category with her project “Grazing Sheep on Deadly Fireweed: A “BaaaaD” Situation?”. Rebekah Kang, PLC Sydney (right) took out 3rd place in the same category with her “Slick and Clean – An investigation into how magnetite can be used with organic sorbents in oil spill clean-up” project. Both Jade and Rebekah will be representing the six-strong Young Scientist team at the 2017 Intel International Science and Engineering Fair to be held in Los Angeles in May. Brothers Callum & Declan Predavec, Mosman High School, won 2nd place in the Engineering category and will be joining the BHPBSEA team at ISEF. They developed two ingenious visibility safety features to increase bike safety.